Child Care Providers render daily support to children of all age groups by performing various tasks such as – monitoring safety of children, assisting children in performing personal tasks and designing age-appropriate curriculums. 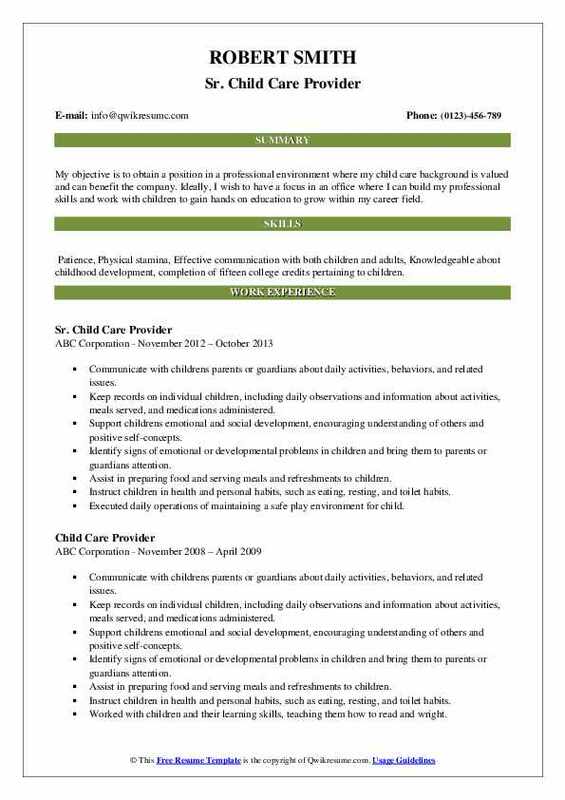 Even though the job settings may vary, the core tasks that are listed in the Childcare Provider Resume remains same and includes – monitoring children to identify their emotional and physical needs, assisting children with personal tasks such as eating, using washroom and dressing up; maintaining a regular schedule of meal times and nap times; keeping children engaged with various learning and fun activities; and assisting with home assignments. Childcare Providers are responsible and patient professionals, who should love children and be able to speak politely and softly. They should possess creative skills and be interactive with kids. They should as well show diligence and monitor children at all times to maintain their safety. Most employers do not want more than a high school diploma or GED, while many prefer additional education and work experience. 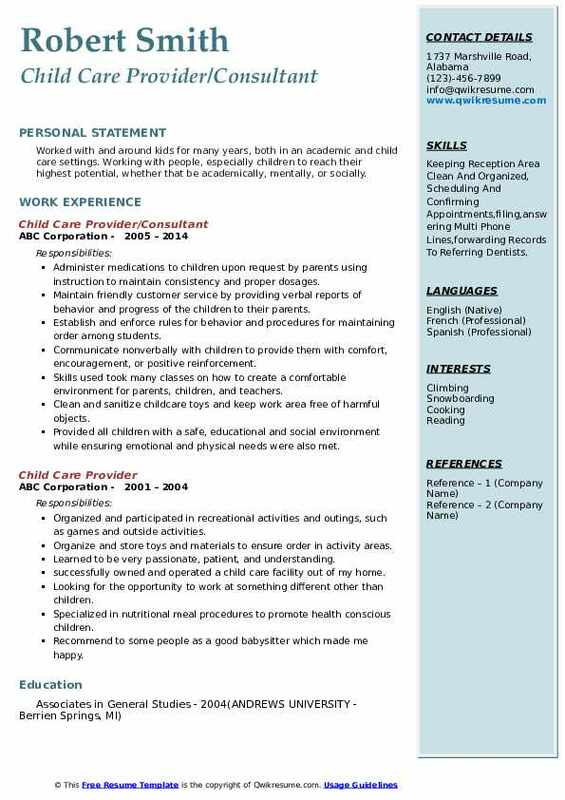 Summary : Hard working and determined individual who has been in the Early Childhood Education field for nine years teaching children from 6 weeks to 6 years. Excel at communication and computer skills and works well in both team settings and solo. 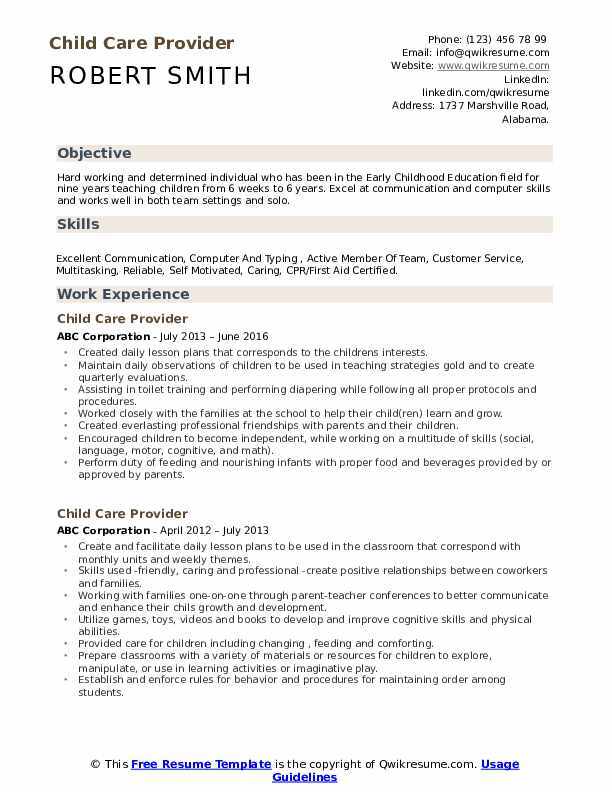 Skills : Excellent Communication, Computer And Typing , Active Member Of Team, Customer Service, Multitasking, Reliable, Self Motivated, Caring, CPR/First Aid Certified. Created daily lesson plans that corresponds to the children's interests. Maintain daily observations of children to be used in teaching strategies gold and to create quarterly evaluations. Assisting in toilet training and performing diapering while following all proper protocols and procedures. Worked closely with the families at the school to help their child(ren) learn and grow. Created everlasting professional friendships with parents and their children. Encouraged children to become independent, while working on a multitude of skills (social, language, motor, cognitive, and math). Perform duty of feeding and nourishing infants with proper food and beverages provided by or approved by parents. Utilize games, toys, videos and books to develop and improve cognitive skills and physical abilities. Maintain friendly customer service by providing verbal reports of behavior and progress of the children to their parents. 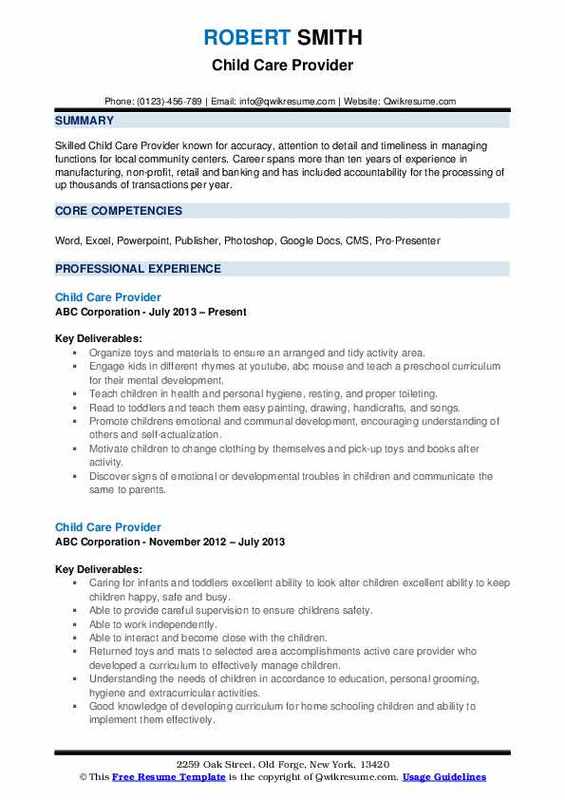 Summary : Skilled Child Care Provider known for accuracy, attention to detail and timeliness in managing functions for local community centers. Career spans more than ten years of experience in manufacturing, non-profit, retail and banking and has included accountability for the processing of up thousands of transactions per year. Organize toys and materials to ensure an arranged and tidy activity area. Engage kids in different rhymes at youtube, abc mouse and teach a preschool curriculum for their mental development. Teach children in health and personal hygiene, resting, and proper toileting. Read to toddlers and teach them easy painting, drawing, handicrafts, and songs. Promote children's emotional and communal development, encouraging understanding of others and self-actualization. Motivate children to change clothing by themselves and pick-up toys and books after activity. Discover signs of emotional or developmental troubles in children and communicate the same to parents. Keep records of every child, including day by day observations and information regarding activities, meals served, and medicine administered. 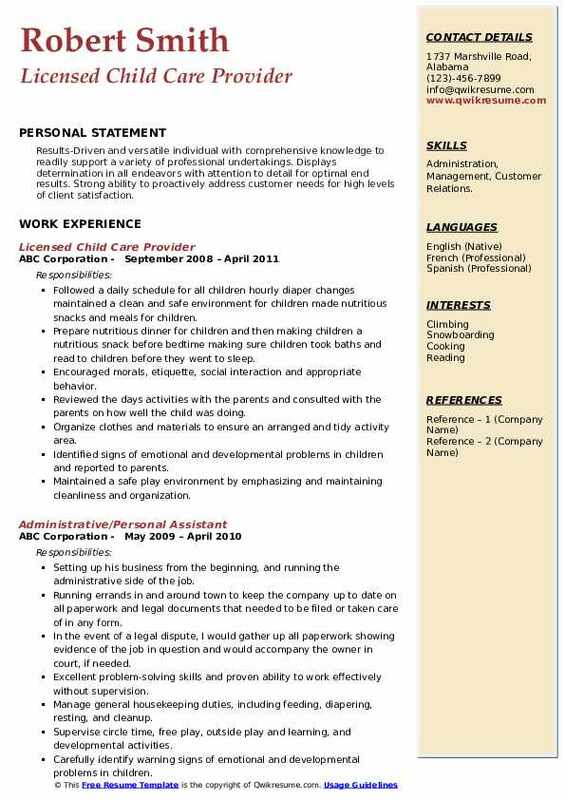 Summary : My objective is to obtain a position in a professional environment where my child care background is valued and can benefit the company. Ideally, I wish to have a focus in an office where I can build my professional skills and work with children to gain hands on education to grow within my career field. 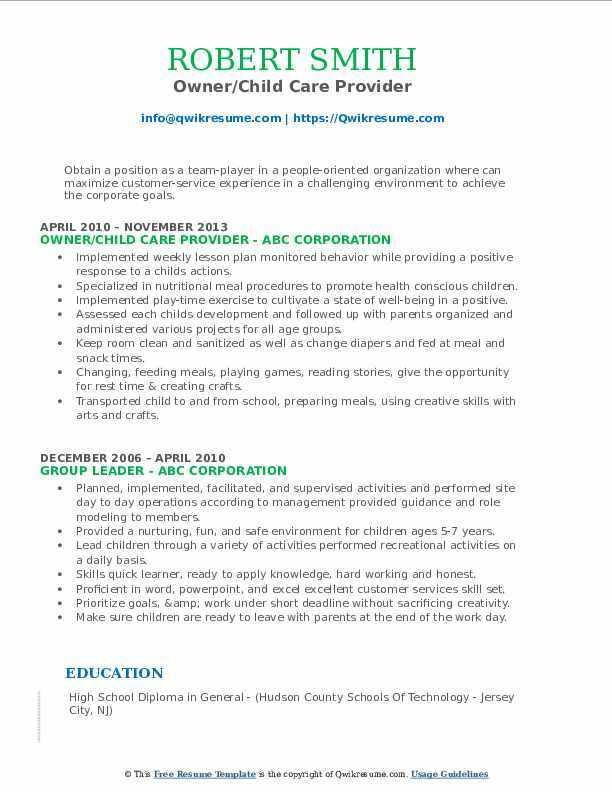 Skills : Patience, Physical stamina, Effective communication with both children and adults, Knowledgeable about childhood development, completion of fifteen college credits pertaining to children. Executed daily operations of maintaining a safe play environment for child. Help children learn and do different things skills used reading, writing, math, letters, colors, teaching, communication, eye contact, etc. 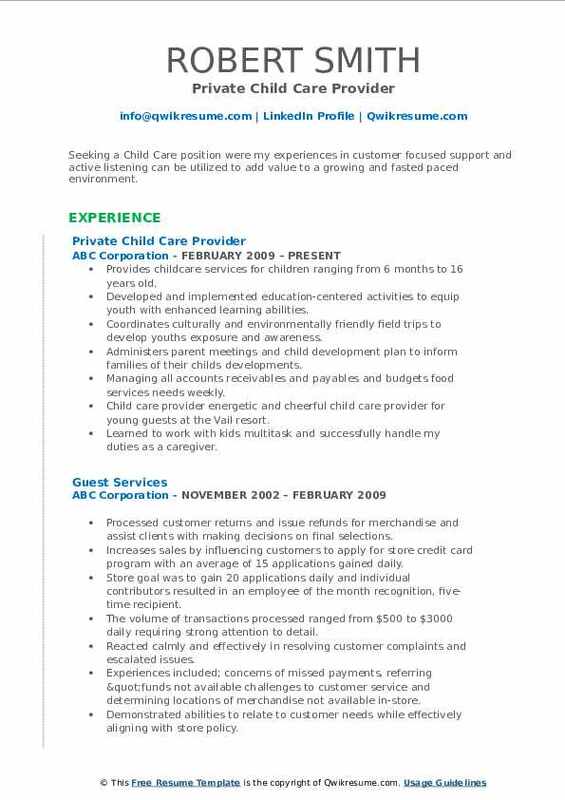 Summary : Seeking a Child Care position were my experiences in customer focused support and active listening can be utilized to add value to a growing and fasted paced environment. Skills : Organized Case Manager, Caring And Empathetic, Resource Management, Client Management, Healthcare And Human Services Experience. Provides childcare services for children ranging from 6 months to 16 years old. Developed and implemented education-centered activities to equip youth with enhanced learning abilities. Coordinates culturally and environmentally friendly field trips to develop youth's exposure and awareness. Administers parent meetings and child development plan to inform families of their child's developments. Managing all accounts receivables and payables and budgets food services needs weekly. Child care provider energetic and cheerful child care provider for young guests at the Vail resort. Learned to work with kids multitask and successfully handle my duties as a caregiver. Organized and stored toys and materials to ensure order in activity areas. Summary : Worked with and around kids for many years, both in an academic and child care settings. Working with people, especially children to reach their highest potential, whether that be academically, mentally, or socially. 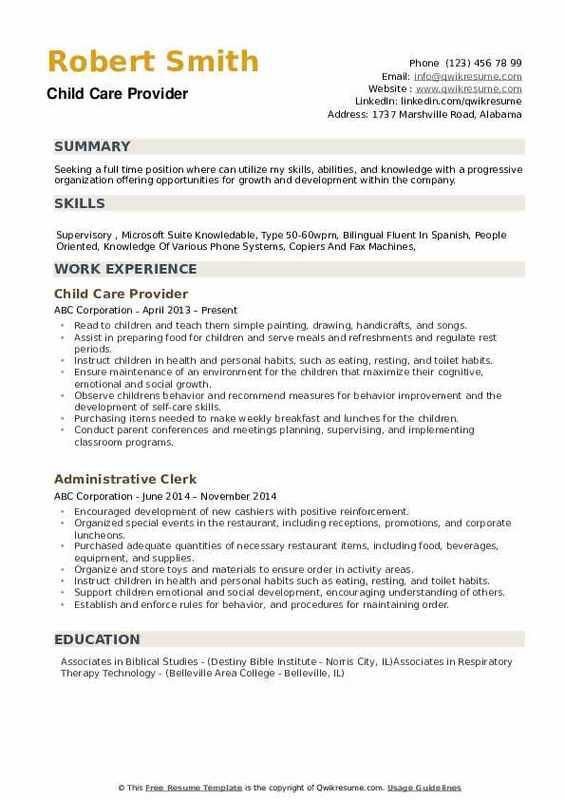 Skills : Keeping Reception Area Clean And Organized, Scheduling And Confirming Appointments,filing,answering Multi Phone Lines,forwarding Records To Referring Dentists. Administer medications to children upon request by parents using instruction to maintain consistency and proper dosages. Skills used took many classes on how to create a comfortable environment for parents, children, and teachers. Clean and sanitize childcare toys and keep work area free of harmful objects. Provided all children with a safe, educational and social environment while ensuring emotional and physical needs were also met. 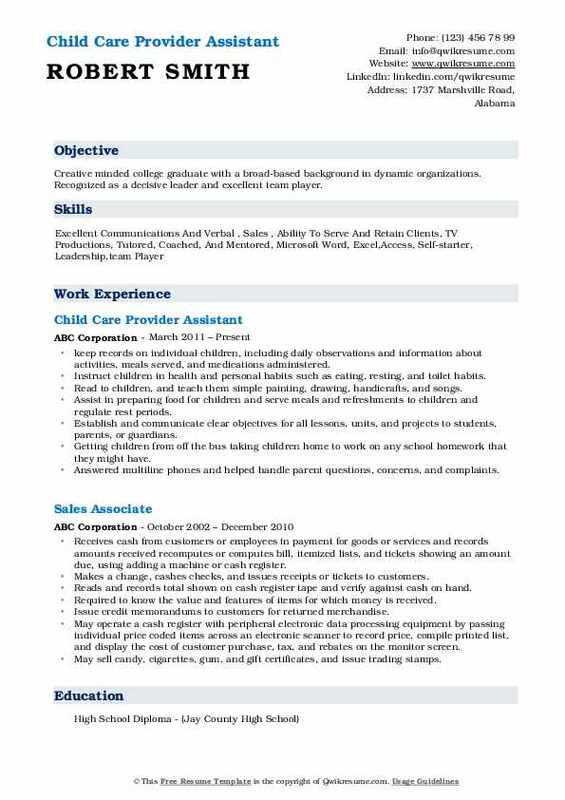 Summary : Creative minded college graduate with a broad-based background in dynamic organizations. Recognized as a decisive leader and excellent team player. Instruct children in health and personal habits such as eating, resting, and toilet habits. Read to children, and teach them simple painting, drawing, handicrafts, and songs. Assist in preparing food for children and serve meals and refreshments to children and regulate rest periods. Getting children from off the bus taking children home to work on any school homework that they might have. Answered multiline phones and helped handle parent questions, concerns, and complaints. Headline : Obtain a position as a team-player in a people-oriented organization where can maximize customer-service experience in a challenging environment to achieve the corporate goals. Skills : Customer Service, Telephone , Professional Image And Communication , Problem Solving, Good Listening , Multi task, Adaptability. Implemented weekly lesson plan monitored behavior while providing a positive response to a child's actions. Specialized in nutritional meal procedures to promote health conscious children. Implemented play-time exercise to cultivate a state of well-being in a positive. Assessed each child's development and followed up with parents organized and administered various projects for all age groups. Keep room clean and sanitized as well as change diapers and fed at meal and snack times. Changing, feeding meals, playing games, reading stories, give the opportunity for rest time & creating crafts. Transported child to and from school, preparing meals, using creative skills with arts and crafts. Summary : Skilled at learning new concepts quickly, working well under pressure, and communicating ideas clearly and effectively. Demonstrated achiever with leading successful teams and managing day to day business practices. Caring for the children would be giving them a sense of security. 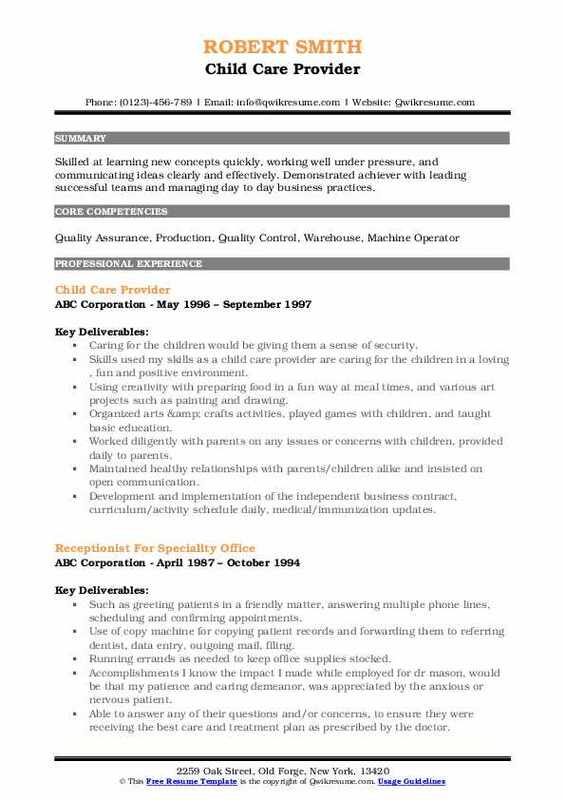 Skills used my skills as a child care provider are caring for the children in a loving , fun and positive environment. Using creativity with preparing food in a fun way at meal times, and various art projects such as painting and drawing. Organized arts & crafts activities, played games with children, and taught basic education. Worked diligently with parents on any issues or concerns with children, provided daily to parents. Maintained healthy relationships with parents/children alike and insisted on open communication. Development and implementation of the independent business contract, curriculum/activity schedule daily, medical/immunization updates. Objective : Results-Driven and versatile individual with comprehensive knowledge to readily support a variety of professional undertakings. Displays determination in all endeavors with attention to detail for optimal end results. Strong ability to proactively address customer needs for high levels of client satisfaction. Skills : Administration, Management, Customer Relations. Followed a daily schedule for all children hourly diaper changes maintained a clean and safe environment for children made nutritious snacks and meals for children. Prepare nutritious dinner for children and then making children a nutritious snack before bedtime making sure children took baths and read to children before they went to sleep. Encouraged morals, etiquette, social interaction and appropriate behavior. Reviewed the day's activities with the parents and consulted with the parents on how well the child was doing. Organize clothes and materials to ensure an arranged and tidy activity area. Objective : Seeking a full time position where can utilize my skills, abilities, and knowledge with a progressive organization offering opportunities for growth and development within the company. Assist in preparing food for children and serve meals and refreshments and regulate rest periods. Ensure maintenance of an environment for the children that maximize their cognitive, emotional and social growth. Observe children's behavior and recommend measures for behavior improvement and the development of self-care skills. Purchasing items needed to make weekly breakfast and lunches for the children. Conduct parent conferences and meetings planning, supervising, and implementing classroom programs. Identify signs of emotional or developmental problems in children and bring them to parents or guardians' attention.